Our official OpenStack Windows Server evaluation images got updated to the freshly released 2012 R2 version just in time for the Hong Kong summit! Full support for OpenStack Havana is included for KVM and Hyper-V. We plan to release images for additional hypervisors as well quite soon (XenServer / XCP and ESXi / vSphere). 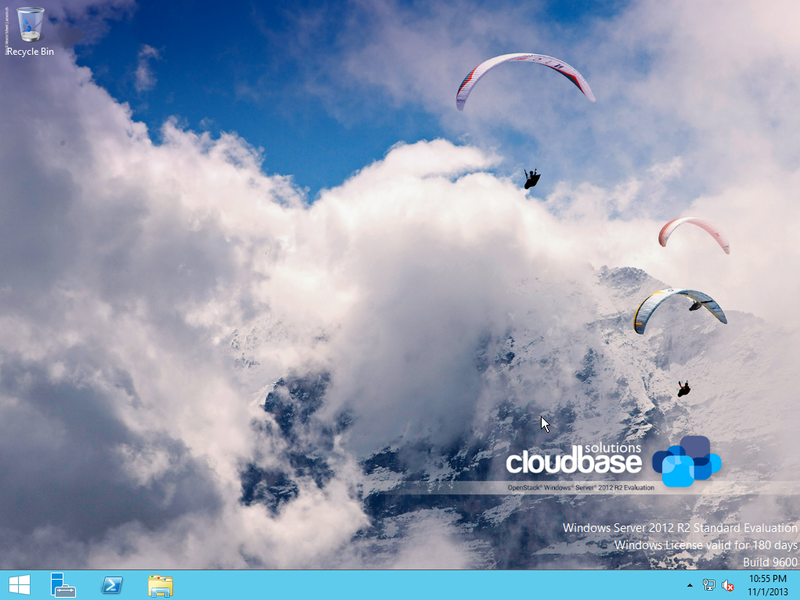 The images include the latest version of Cloudbase-Init, with new features and a fix for an issue that prevented to retrieve, in some circumstances, the Admin user’s password in the previous Grizzly 2012 image. The first thing consists in downloading an image and uploading it in Glance. Now just boot the image as usual, providing a keypair, which is needed to retrieve the password later. Please note that the HTTP metadata service must be available in order for this feature to work. If you see a blank password, most probably the HTTP metadata service was not available when the password was set or the instance has been booted without a keypair assigned. Assign a floating IP to your instance and point your RDP client to it. When prompt for credentials, provide “Admin” and the password retrieved at the previous step. Beside Windows, there are official Microsoft RDP clients available for OS X, iOS and Android. How are those images created? Here’s a post with a detailed explanation! I try to attach a Cinder volume to a running Openstack/KVM instance started with the Windows image you provide. Each type I get a Windows BSOD. Did you try this feature ? Does it work ? About the BSOD: This is a VirtIO driver issue that we found in some conditions on KVM. Hyper-V is immune from VirtIO drivers issue, if this is an option for you. We’re investigating more this issue right now as in the past we already had issues with the latest stable VirtIO drivers. I have trouble getting Windows Server to work. The problem is that it gets stuck in Booting from Hard Disk and the loops over and over again. I have set OpenStack – Havana on two node setup using ubuntu guide. OpenStack test enviroment is running on VirtualBox. I have tested my build with cirrOS and it runs fine. I’ve also veryfied SHA1 hash and it’s OK. If you are using VirtualBox, it means that you are running on QEMU instead of KVM. Instead of VirtualBox I’d suggest to switch to an environment that supports nested virtualization (e.g. VMWare Workstation / Player / Fusion) and use KVM.